November 3, 2014. Fourteen hours, eight suitcases, and several drinks later, we’ve finally made it to Norway. So much for Round 1 of our international move. 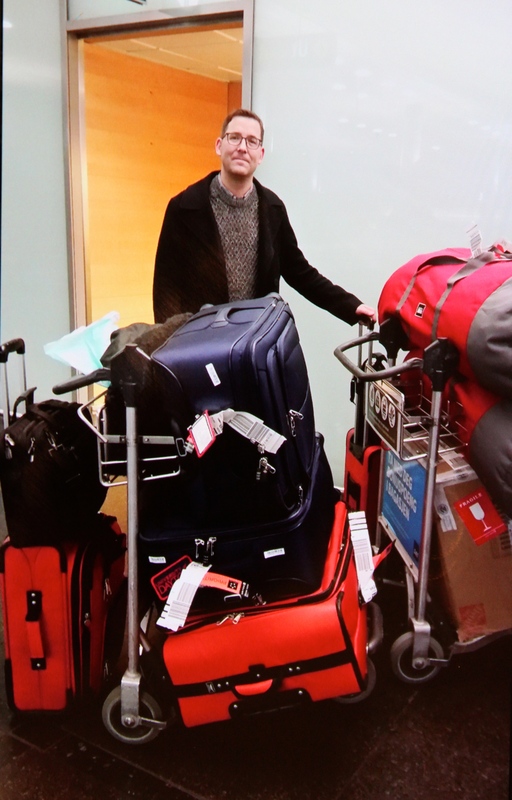 Because Matthew’s transfer is for only a year, shipping everything on a slow boat didn’t seem to make sense; hence the large number of suitcases. However, I must confess that this entire load of luggage consists of nothing but my wardrobe, since Matthew’s closet made the trip with him during his initial move in mid October. I have a strict “no child left behind” policy when it comes to clothes, shoes, and jewelry. Since I’ve had to abandon most everything else back in Chicago — my family, friends, career, home, and most of my worldly possessions — my clothing has become the flotsam that I cling to for security and identity. It comforts me and reminds me of who I am when everything else feels really unfamiliar and just a teensy bit scary. Matthew is clearly thrilled about shepherding my copious luggage. As it turns out, my fashionista security blankets weigh an ungodly amount. So it was with much grumbling and groaning that we managed to schlep eight heavy bags curbside once we’d arrived at Oslo’s Gardermoen Airport, where we ordered a taxi for six people (thinking that this would result in the appearance of a minivan and thus resolve our little luggage problem). No such luck. The tiny station wagon that showed up cowered in the face of our load, but after negotiations with another less-encumbered traveler, we switched taxis and snagged a minivan — hallelujah! A short ride later and we pulled up in front of our new home — a place we’d seen only in photos on the internet a week earlier. Although one of Matthew’s colleagues had toured the apartment to confirm that it wasn’t a “bait-and-switch” scenario, we were still pretty anxious, having received and signed the lease only minutes before we boarded the plane. Let me back up just a bit — Matthew’s company typically rents temporary “Jimmy apartments” (so named for the landlord), which are perfect for singles but not really adequate for couples with kids … or in our case, cats … and lots of clothes. Ten minutes after moving into one of these cubicles in October, Matthew called me and said “you’ll be miserable here; let’s start looking for a bigger place.” Thus began our frantic search for an apartment on Finn.no — the “Craig’s List” of Norway — where most Norwegians find their rental living quarters. After several rejections due to our cats, we finally found a landlord in our desired neighborhood who was willing to rent to someone with furry critters … at a price. I’ll be honest and say that Norway ain’t cheap — a refrain we’ll likely revisit throughout this blog. 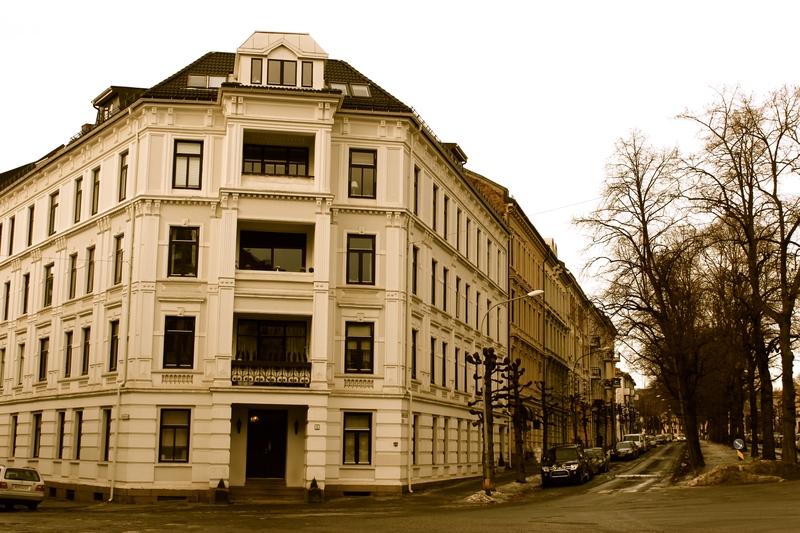 A furnished, two bedroom place in the Frogner neighborhood goes for between $3,000 – $4,000 a month. Add to that the two-month pet deposit, and we found ourselves with quite a hefty initial rent payment and an empty savings account. So it was with crossed fingers that we pulled up in front of our place, hoping that it would be worth the price we were paying. And at first glance, I have to say we were thrilled. The stately Victorian presided over the apex of a five-way intersection in a neighborhood of elegant Haussmann-esque buildings that made us feel like we were stepping out onto a Parisian boulevard. At the door to meet us was Karl, the landlord’s father (the landlord being a 20-something banker who’d been transferred to New York). An older gentleman, Karl surprised us by grabbing one of the heavier suitcases. When Matthew protested, he grinned and wryly replied, “Time for your first lesson about Norwegian stubbornness.” Up the four flights of stairs he trudged, huffing and puffing, while I rapidly googled the equivalent of Norway’s 9-1-1, just for safety’s sake. By the way, in case you missed it, I said four flights of stairs. 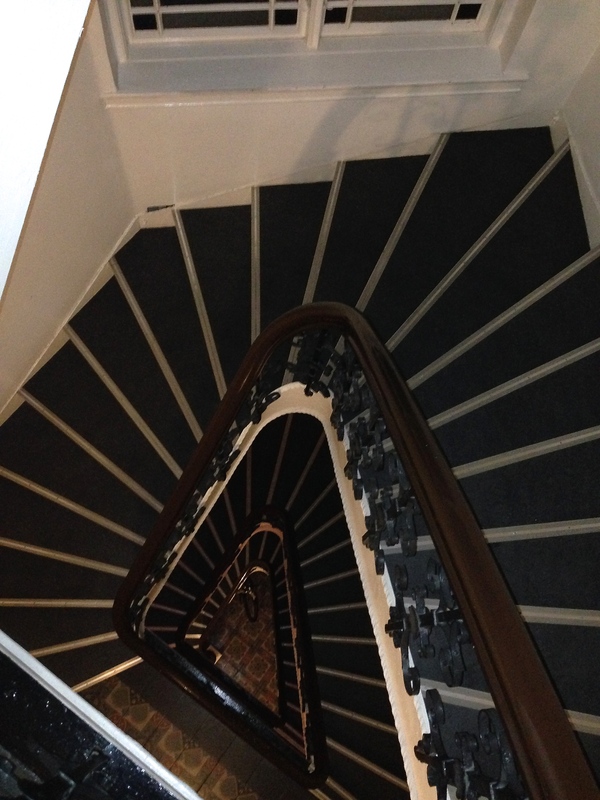 That’s twenty-two trapezoidal stairs per level — all spiraling and tilting whimsically with age. By the time we reached the top, I was dizzy, faintly nauseated, and distinctly nervous about whether the trek would deter any of our friends and family from visiting. So a warning to all potential guests: DO NOT WIMP OUT ON ME! Those who do muster the courage to hike up to our aerie will be amply rewarded with awesome views of the city (as seen in the top photo). Plus, the space has a really funky vibe, being a curious mix of modern Scandinavian design with just a dash of “alpine” flavoring. And if that’s not enough to woo you, we have a fabulous heated terrace with fluffy sheepskin-covered chairs to keep you warm and cozy in every season. It was these amenities, plus the wooden beams, heated bathroom floors, and two fireplaces, that made those next seven trips back up and down the stairs to collect the remainder of our luggage totally worthwhile … at least that’s what we told ourselves. Entry foyer — love the floors!